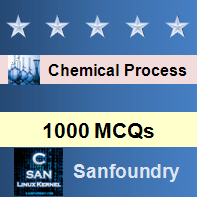 This set of Chemical Process Calculation Multiple Choice Questions & Answers (MCQs) focuses on “Stoichiometry – VI”. 1. What is the value of a? Explanation: Carbon and Oxygen on both the sides. 2. What is the value of b? 3. What is the value of c? 4. What is the value of d? Explanation: 1 mole of CH4 is equivalent to 2 moles of H2O. Explanation: 1 mole of O2 is equivalent to 1 moles of H2O. Explanation: 1 mole of CH4 is equivalent to 1 moles of CO2. Explanation: 2 moles of O2 is equivalent to 1 moles of CO2. 9. For producing 36 gms of water in the reaction, how many moles of CH4 are required? Explanation: 1 mole of CH4 is equivalent to 2 moles (36 gms) of H2O. 10. For producing 90 gms of water in the reaction, how many moles of O2 are required? Explanation: 1 moles of O2 is equivalent to 1 moles of H2O.